Hi, Ladies! I'm visiting from the IVF board but wanted to post this here at well. This study is open to women ages 18-45 so I wanted to make sure as many people know about it as possible. These IVF studies fill up quickly!! I was cruising the clinicaltrails.gov website and found an open IVF study at the University of California in San Francisco. I thought I'd pass it along to anyone in the Bay area who was interested. I'm in a research study in Florida and it's the best thing that happened to us. It's saving us $11,000!! I believe in "paying it forward" so here you go! Good luck!! 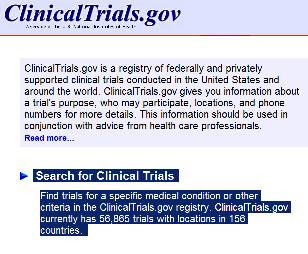 Find trials for a specific medical condition or other criteria in the ClinicalTrials.gov registry. ClinicalTrials.gov currently has 56,865 trials with locations in 156 countries.